Home > Questionnaires > Questionnaire: Do You Speak the Language of Recycling? Everyone’s talking about recycling, but how much of what we hear do we understand? Sometimes you’d be forgiven for thinking you’re listening to a foreign language with all the jargon, buzz words, acronyms and abbreviations. Can you tell your PFI from your MRF, and do you instantly know whether waste in inert, special or active – or do you struggle to work out which item should go into which skip at the recycling centre? Recycling really does have a language all of its own, and the question is, just how fluent are you? If you’ve ever wondered, here’s a quick 12-question quiz to test your knowledge – so have fun and good luck! 1. HDPE is a valuable recyclable, but what is it? c) Highly desirable plastic elements. 2. Many food and drink containers are made from PET, but what does it stand for? a) Plastic for the entertainment trade. b) Market for selling waste. c) Ministry for sensitive waste. 4. MRFs can help councils achieve recycling targets, but what are they? 5. What is ‘active waste’? a) A mix of all the dry recyclable types. b) Waste that will biodegrade if placed in a landfill. c) The material that comes from waste skips. 6. Which of the following is NOT a ‘dry recyclable’? 7. Where would you expect to find putrescible waste being recycled? a) In a metal foundry. b) In a compost heap. c) At a paper mill. 8.What is source separated waste ? a) Waste which has been separated into individual types for recycling by the householder. b) A way of collecting industrial waste; it is taken direct from the source to a disposal site. c) Waste separated for recycling at a central council site. b) Sorting through waste by hand. c) Stealing material from official recycling facilities. 10.Anaerobic digestion is a great way to recycle some kinds of waste, but what does anaerobic actually mean? 11.We all know about ‘white goods’ but what are ‘brown goods’ ? a) Small domestic electrical items, such as toasters and kettles. b) Large domestic electrical or electronic items, such as TVs and video equipment. 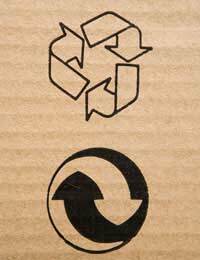 c) Heavy cardboard or thin wood boxes, crates and packaging material. a) The quality of glass used in wine bottles. b) Brown or green glass. c) Recycled or broken pieces to be used in making new glass. 1. a) HDPE stands for high density polyethelyne. 2. b) PET is polyethylene terephthalate – so you can see why they abbreviated it! 3. a) MSW is municipal solid waste, straightforward, unsorted dustbin rubbish. 4. c) MRFs are materials reclamation (or recovery) facilities, machines designed to sort waste quickly and efficiently for recycling. 5. b) Active waste is the name given to material which will biodegrade, or change significantly either physically or chemically, if it is placed in a landfill. 6. b) Kitchen waste is not a dry recyclable. 7. b) Putrescible waste is biodegradable, so the answer’s in a compost heap. 8. a) Source separated waste has been separated by the householder into individual types for recycling. 9. b) Tatting, also known as totting or hand picking, is sorting through waste by hand to remove recyclable items. 10. a) Anaerobic means without oxygen; anaerobic digestion, unlike composting, has to be done in a sealed container where the internal atmosphere is free of oxygen. 11. b) Brown goods are large domestic electrical or electronic items. 12. c) Glass cullet is the recycled or broken waste pieces to be used to make new glass. 6 to 11 – Reusable! 2 to 5 – Repairable! 0 to 1 – Rubbish! A great quiz, good fun. I'm pleased to say that I am fluent with a score of- 6 to 11 – Reusable! I have always thought that MK Council workers do a splendid job, even more soafter spending a long weekend with family in Surrey, they are way behind!! Thank you Milton Keynes.